Uneasy Empires: Who gets killed by cloud computing? Who gets killed by cloud computing? "It's only a flesh wound!!" It's always more fun to watch someone get cut off at the knees. As I mentioned at the end of my post on Tuesday, as well as winners there are big losers from Cloud. This is because a shift in IT architectures shifts where IT budgets are spent. This change in spending can rapidly change the fortunes of IT vendors. In fact this is one of the big themes of my blog: How giant tech empires can be disrupted almost overnight, while other great powers rise in the blink of an eye. We can vividly see it in the world of cloud computing. To understand why we need to look out how Cloud works in practice. Cloud isn't rocket science. It really isn't. As I intimated before, its basically old-school business outsourcing in a frock. The chart below shows the typical IT set-up in a big business. In particular look at the purple column on the right. 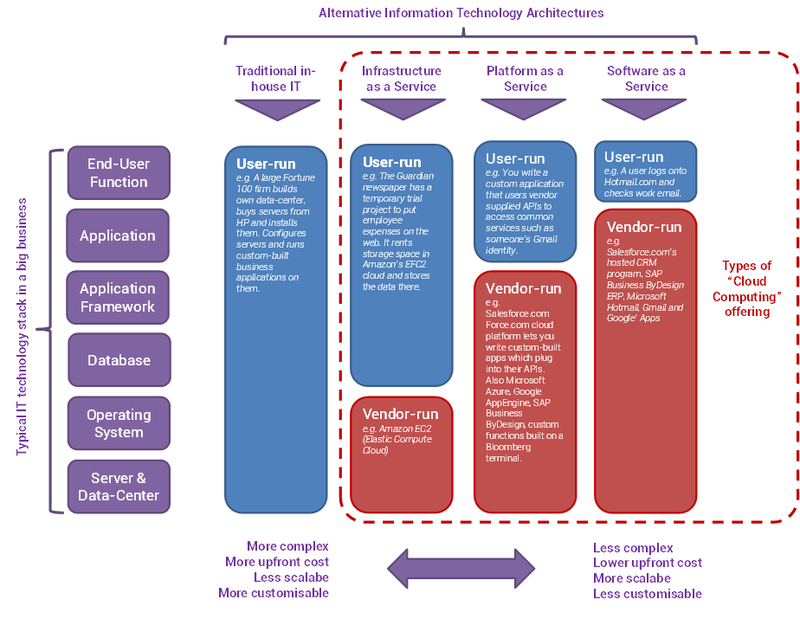 This shows how an IT system is built up - layers of different functional systems (e.g. server, database, operating system) built on top of each other. Each layer depends requires all the blocks beneath it to work, and each layer is generally supplied by a different vendor. In a traditional in-house IT setup, the second column, all of this is run by the end-user (the company deploying the IT). They buy all the components from the different vendors, stitch them together (with a little help from their mates at Accenture) and run it themselves. Infrastructure as a Service (IaaS): I always describe this as like a homeowner buying a shell of a house - four walls, some windows and a ceiling but nothing else. In real terms this means that the cloud vendor runs a data-centre full of servers with basic functionality, and lets the users install whatever databases and software they want on them. The most famous exponents of this is Amazon, which leases out space in its Elastic Computer Cloud (EC2) for a pretty low sum. Platform as a Service (PaaS): If IaaS is like buying a shell of a house, Platform as a Service is like buying a house with the electricity and the plumbing already laid in. Instead of just running a dumb server, the cloud vendor also slaps on a database and an application framework. You have APIs which can take care of mundane functions such as connecting to a printer, or authenticating a user when they log in. But you are free to build pretty much whatever app you like on top of this. Salesforce.com runs a platform called Force.com which is the increasingly common in enterprise computing. Zynga games such as Farmville running on the Facebook platform are a consumer equivalent. Software as a Services (SaaS): This is like renting out a house already furnished and connected up to the utilities. The vendor builds the whole end-user application and you just access it, typically via a web browser. GMail or Hotmail are the most commonly used SaaS applications. The website you're reading this on now - Blogspot - supplies all the tools needed to create a blog as a SaaS offering. Note how this relates to the chart above - at every stage in the evolution from Infrastructure to Platform to Software as a Service, more and more of the traditional tech stack is being outsourced to the cloud computing vendor. Also note that a lot of this isn't actually that new. Infrastructure as a Service is simply traditional infrastructure outsourcing in a frock. Software as a Service is hardly new either - Hotmail.com is sixteen years old. What is new is Platform as a Service - that is a genuinely innovative way of doing things that has the potential to change how software is written. So far so good. But note the darker side of this for the technology vendors. As each layer of the IT stack is taken over by a cloud vendor, the companies which supply that component are screwed. Think about the market for databases. Oracle has a lovely businesses selling relational database software to millions of businesses, all of whom have exactly zero negotiating power over Oracle. However once you move to a Platform-as-a-Service or Software-as-a-Service model the end users no longer buy the databases. There is only one database buyer in the market - the guys who run the PaaS or the SaaS. So at best Oracle's negotiating position is dramatically weakened (they have to deal with a much larger customer). And at worst the cloud provider might decide to junk the industry-standard Oracle database entirely and build their own data management layer. In fact this is precisely what SAP is doing with its Business ByDesign cloud ERP software - it runs on an in-house database evolved from SAP's own MaxDB product. We are seeing a similar effect going on in servers. As I wrote before, Google have long built their own servers and other cloud companies like Facebook are following suit. Instead of going to traditional server vendors such as Dell or HP, Facebook is pushing the Open Compute initiative to build generic low-cost servers. Server incumbents lose out, components suppliers which might sell motherboards or memory into Open Compute servers win out. Think about IT Services companies like Accenture - traditionally much of their profits have been derived from bread-and-butter systems integration work, making legacy IT systems all work together. But if we move to a SaaS world there is no longer any legacy IT to stitch together; it is all run on Google's already-integrated Apps platform. And what about Microsoft? How much money will they make selling Office and Windows if I just pop up Google Apps in a Linux browser and start tapping happily away. Its interesting to see Sony buying cloud gaming vendor Gaikai - because if broadband networks catch up, how much demand will there be for a power-hungry home games console if you could just stream Halo XVIII frame-by-frame down your fiber connection? Everywhere you look there is potential for dis-intermediation as the world moves towards Cloud Computing. Of course that is not to say the empires aren't striking back. They still have vast financial resources to compete against cloud disruptors or to simply buy them out before they become a threat (a favoured tactic of Larry Ellison at Oracle). And certainly in enterprise IT world (but less so in consumer tech) customers are incredibly conservative and slow to change. Hey remember both business are still on 2001-vintage Windows XP! But if you want to see disruptive technology and business disintermediation going on before your eyes, just look to the Cloud. Leading to new studies have been writing. I have followed the blog. I'm getting really very useful information. Thanks for sharing your innovative ideas to our vision. I have read your blog and I gathered some new information through your blog. Thanks for sharing this nice and relevant information. We are also working with cloud computing. Croma Campus Noida gives Cloud Computing Training in noida in view of current industry measures that helps participants to secure arrangements in their fantasy occupations at MNCs. Croma Campus Provides Best Cloud Computing Training in Noida. I own quite a large, international dating website for a few years now, but as it grew bigger and bigger, I experienced some serious issues with the software I had in my company. It wasn't very intuitive and instead of bringing my team together and making them working together with passion and creativity, it made them sink into their computers for the entire day. It was until I reached out to a consulting company which helped me kickstart my website (and my team!) once again with brand new software. Thanks For sharing this beneficial and informative web log. i like the means that you simply describe the items. This is very informational blog. it is very awesome blog . Thanks for sharing this. Thanks for sharing this blog. I have learned more about cloud computing. Share more like this. Useful blog, share more about cloud computing. Thanks for sharing a very interesting article about Who gets killed by cloud computing? This is very useful information for online blog review readers.Keep it up such a nice posting like this. KVCH is one of the best leading training in Noida for the young aspirants. It provides from basic to advanced level of training with the live project. Thank you for sharing such a great information about sap ,very useful to us. Kvch – trainingatdelhi well-equipped Best 6 Weeks training in Cloud Computing in Delhi provides real time projects along with 6 weeks Cloud Computing placement training. Cloud Computing Training in Delhi has been designed as per latest industry trends and keeping in mind the advanced Cloud Computing course content and syllabus based on the professional requirement of the student. Very Nice Blog! You have shared so amazing post. I read this blog, this is definitely one of the best post and it is really informative. Thanks for sharing. Excellent info, Thank you ! KVCH is very popular for a big data hadoop summer training institute in Noida, KVCH provides live project based big data hadoop training at very low cost and serves quality of learning experience for every student. IBM & Oracle is our business partner. KVCH gives 100% to every student for making a career in your real job profile. For more information visit our website and contact us at +91-9266-625-607.KVCH is very popular for a big data hadoop summer training institute in Noida, KVCH provides live project based big data hadoop training at very low cost and serves quality of learning experience for every student. IBM & Oracle is our business partner. KVCH gives 100% to every student for making a career in your real job profile. For more information visit our website and contact us at +91-9266-625-607. Nice and thanks for sharing this brief explanation about the ERP systems. What a very informative post! You clearly listed about cloud computing types and many more. Cloud systems help not only bigger transactions, but small businesses as well.. Thanks for the post! Thank You for sharing An Awesome blog for our knowledge.please keep sharing. No particular software program is required to make the most of these purposes. For instance, a couple of fashionable cloud-based apps which can be broadly used right this moment are the free e-mail choices comparable to Gmail, Yahoo! Mail and Hotmail. Fb can be a cloud-based app.This is great blog. If you want to know more about this visit here Internet of Things. Thanks for sharing such a great information, I just loved it. Moreover, it is really knowledgeable. Keep up the good work. You can know more about Cloud Based Service Management Software by clicking mentioned website. Looking for a SaaS App Development Company? Augurs Technologies is SaaS Application Development Company in India and develop custom applications for your growing business. It is an interesting post. I really appreciate your work you have done. Good to read very impressive. Great work. thanks for sharing valuable information. It’s really good. Facebook - What are you doing? ?